The ocean is the most majestic, abundant and diverse ecosystem on the planet. It covers approximately 70% of the world’s surface and is so large it has been divided up into five inter-connected oceanic divisions. The oceans provide around 70% of the oxygen that we breathe and hold 97% of the world’s water supply; without the oceans we would not be here today. The ocean is full of the most beautiful marine life and marine plants, which are extremely beneficial to us. The ocean provides over 14% of the protein that we consume globally, and is home to some of the most incredible and diverse plant life, which has been scientifically proven to help reduce pain and inflammation, as well fight against certain types of cancers. Every year, over 8 million tons of plastic are being dumped in our oceans, which can take hundreds of years to degrade. Not only are plastics harmful to the ocean, other forms of pollution are finding their way into the oceans through industrial dumping and surface run-off. These pollutants include; petrochemicals, asbestos, lead, oil, mercury, phosphates and nitrates, all of which have extremely detrimental effects on the ocean and its inhabitants. Roughly 36% of waste oil found in the ocean comes from surface run-off, with perhaps surprisingly only 12% being caused by headline-grabbing oil spills. Crude oil is extremely toxic to marine life and is also difficult to clean up. Animals that come into contact with crude oil can suffer with disorientation and suffocation, as well as experience behavioural changes and death. As well as oil, plastics and heavy metals, radioactive and industrial materials are also entering our oceans at an alarming rate. These can lead to nitrification of large areas of the oceans, which exhausts the amount of oxygen within the water and renders the environment inhospitable to marine life. In the Gulf of Mexico, there is approximately 5000 square miles of ocean, which is almost completely devoid of life. In addition, there are around 400 ‘dead zones’ throughout the oceans. There is so much to learn about the oceans and once you understand how incredible they are, there will be nothing stopping you from becoming an advocate for our oceans. 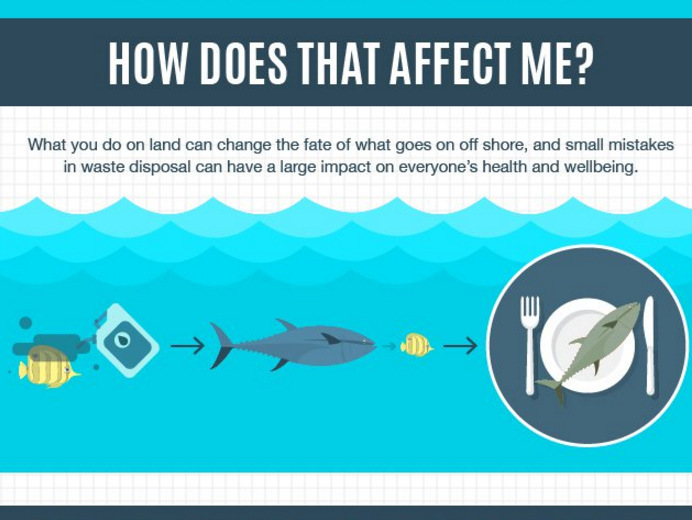 Learning how pollution can affect marine life as well as life on earth, through consumption and the food chain, can help you to reduce your plastic usage and help you to show others what to do, to ensure that our oceans remain alive and beaming with life for generations to come. Thank you to the team at DIVEin.com for submitting this article, and sharing their excellent infographic with us, below.